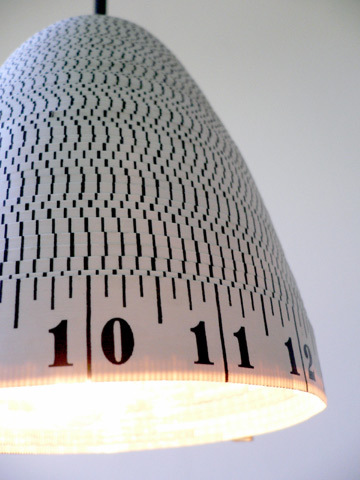 Carmen sent a link to the lamp above — made of measuring tapes! So cool. Cel sent this link to "Make It Yourself": Home Sewing, Gender, and Culture, 1890–1930 by Sarah A. Gordon — really worth looking at. Jay at CLMP let me know about Sonya Naumann's great art project: Thousand Dollar Dress. Sonya is taking pictures of a thousand different people wearing her thousand-dollar wedding dress! Genius. If you want to make the world a better place for women, I can't imagine a more satisfying place to put your money: Goods4Girls gives reusable "sanitary supplies" (that is, menstrual pads) to girls in Africa, because if they don't have them, they can't go to school. (And regular paper products, when they can get them, can't be disposed of safely.) I suggest donating a week's worth of pads, if you can; they don't take direct cash donations but offer a list of suppliers who will make them and send them to Goods4Girls for you (they also offer instructions to make your own). "The untidiness men find repugnant … the carelessness men can't stand …". Thanks to Deborah for the link (and check out her magnificent coat on the cover of Vogue Knitting)! Nikkie, the curator the Fort Morgan Museum in Fort Morgan, Colorado, is looking for help; they are having an exhibit this fall on the WPA (Works Progress Administration, later the Works Projects Administration) and its impact on Morgan County. One of the local WPA works in Morgan County was a Sewing Project, where simple, serviceable apparel was made and then distributed as part of the relief efforts. If you have any of the standard patterns used for the WPA program, or any finished clothing items, and would be willing to lend them to the museum, would you contact her through the link above? Jezebella sent in this skirt. Please click that link to see the best and most hilarious pocket ever. Rita made a vintage-patterns video! Elisa (aka The Mad Fashionista) was in the NYT! Congratulations! Nora sends a link to Etsy seller Jane Bon Bon who makes GORGEOUS skirts and dresses, including plus-size. Marvelous appliqué. She makes stuff to order, with no extra charge for plus-size and her prices are very reasonable for custom work! Remember, if you want to send me a link for Linktastic Fridays (no promises! ): 1) email me links to pictures, not the pictures themselves, if at all possible; 2) if it's your auction/site/whatever, please disclose; 3) tell me if you want your name (and how much of it) attached to the link and linked to your site, if applicable. Thank you! Who votes for Jane BonBon to be on Project Runway and WIN? I do! I do!I LOVED the 1950’s Atlantic piece. Ah, Linktastic Fridays. A definite high point in my week. I knew you’d love that tape measure lamp! I saw it too and thought of you. Wouldn’t it be cool in alternating colors, like stripes? Dahling, thank you SO much for mentioning the write-up in the Style Section of The New York Times. The old Gray Lady was much improved by my presence, methinks. Although they did airbrush my cleavage and Bucky’s, er, ah, little black oboe. very clever and cool looking lamp! I love the paper dolls! They look like real people! She has a waist! and hips! and thighs! and boobies! She looks like me! Yay!Click on the picture- I would mind having the “Romantic Hero” pictured below! Oooh la la! I’m seriously thankful to you and Cel for that wonderful link. Right up my alley. I’m really enjoying the Sarah A Gordon book online – thanks! Thank you so much for the Good4Girls link!I definitely have to help them. Plus reading through their pattern links, I may help myself too since I also have problems with the bleach and plastic products. Yay! That lamp and Jane Bon Bon are both fabulous! The uterus skirt is too funny.